Feeling stressed and looking for tips for relieving stress and anxiety? Stress is a natural response of our body. It is one way that our body reacts when faced with an outside pressure that demands our attention. When we experience events that alter our physical or emotional balance, we feel stress. Stress can be either good or bad. As we move through our daily lives, we have to deal with the obstacles and pressures that arise naturally when we try to overcome them. We may feel “stressed” in trying to meet the expectations of others or fulfill all our responsibilities. But stress is not always bad. From another perspective, it is stress that makes us do our best and achieve our goals in life. It motivates us and helps us to be alert and focused on the task. When we begin to feel overwhelmed by our many responsibilities, stress begins to negatively affect us. We are a society that is busier and more stressed than ever. In today’s modern society, most of what we face from day to day is stress that can take an emotional toll on our minds, our bodies and our health. This can be a very real psychological and physiological condition. In other words, stress is not only in our heads, it can affect us physically. While they can vary widely from person to person, many signs of stress are easy to identify. Stress can seriously affect our body, mind and emotions. Stress can manifest as fatigue, migraines, headache from mild to intense, stomach problems and ulcers, rashes, hypersensitivity, irritability and depression. There is no quick fix or pill that you can take to heal or prevent stress. To find healthy ways of dealing with stress is the key to keep it from negatively impacting our health. Here are some tips for relieving stress and anxiety that we face daily. Slowly breathe deeply through the nose several times. Concentrate on the air filling your lungs. Clarify your mind and imagine the tension being released from your muscles. Do that for a few minutes. It seems easy, but deep breathing can be very relaxing. Laughter is a natural remedy for relaxing the body. It has been shown to reduce tension, improve your mood and can boost your immune system. It can also stimulate organs and release tension in your muscles. Plus, it is just an overall fun way to feel better. Check in with your body periodically to see where you may be holding stress or tension in your muscles. For example, if you catch yourself clenching your teeth or jaw, relax your tongue and other muscles in your mouth. Another place we are prone to notice we carry stress is in our neck and shoulders. Are you pulling your shoulders up as a reaction to stress? If so, check in periodically and self correct. Try to keep muscles relaxed every time you do your periodic check-ins during the day. Notice where you are holding stress in your body and do your best to release that stress from your muscles and relax. Choose one or two of these tips to try. Find the ones you like and stay with them. 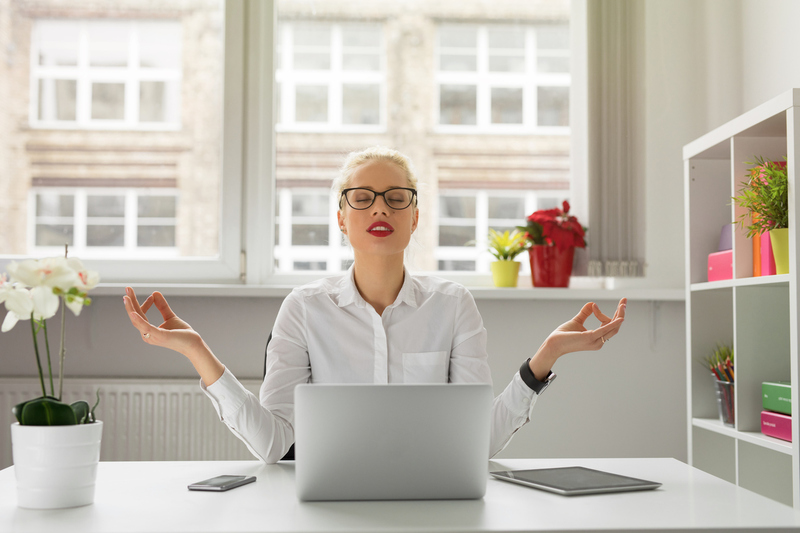 Actively practice your stress management techniques and you will increase your mood and your productivity, while decreasing your chances of experiencing symptoms related to stress. Reducing stress is important to your health and wellness. To find more ways of reducing stress in your life, especially through healthy activities like exercise, you may benefit from working with a physical therapist to introduce new routines into your health and wellness program. To learn more about how physical therapists promote physical fitness and to see what physical therapy can do for you, contact us today.